You can make the least glamorous room in your house fun to work in. There's a totally easy, quick fix to make doing laundry more comfortable, and you're about to learn how. Some of the things I love most about my grandma’s house are the rugs in her laundry room. They’re so cozy, and my feet are always cold. Like many things in her house, the rugs have a story. Because they have a story, they always felt special somehow. It’s rare to find someone who actually enjoys doing laundry. But when I have to do it, I prefer the comfort of having a rug under my feet. Putting rugs in your laundry room can do more than just keep your toes warm. Any foot traffic in and out of a room brings all kinds of dirt with it. With a cozy area rug, the dirt becomes a lot more manageable. Rugs in a laundry room also help add color. If you don’t have a lot of wall space to decorate, or you want to change the color palette without painting the walls, an area rug can make a quick and cheap fix. Sometimes, all you need is some quality time spent with your laundry room. Make it more than just a breeze-through area. Personally, I love playing with lighting. Few things ruin a room faster than bad lighting. Chandeliers grab people’s attention. They can be elegant and sophisticated, and they can be minimalistic. It’s hard to do laundry in a poorly-lit room. But harsh fluorescent lights don’t exactly feel good on your eyes either. A chandelier lights up the whole room so you can see what you're doing. But it does it in a way that looks beautiful, and not utilitarian like so many laundry rooms. My grandmother painted her laundry room a bright coral. She also painted her garage door lavender, but that’s besides the point. Using a bold color doesn’t just make a statement. It makes a space look fun and inviting. My grandmother’s laundry room is small, with only one window. She lives in Ohio, which means long gray winters. Having a coral laundry room makes the space feel good to be in. You know when you walk into a room and you find yourself smiling just for being there? The people in the room can have a lot to do with this. But the decor of the room plays a part too. Maybe coral isn’t your thing. It doesn’t have to be. Candy apple green, yellow, find a color that makes you happy. Then add that color to your laundry room in the form of a rug, paint, or other decor and see how it makes you feel. Mix and match colors for a fun, playful effect. Between making your own signs for the walls, rotating through different area rugs, curtains, or painting your shelves a new color, there are so many ways you can do this. Go ahead, add some of your personality. A laundry room can be the perfect place to display art you’ve made or a collection of funky little things from your favorite vintage store. The creativity doesn’t have to stop there. You have your own preferred organization method, but that doesn’t mean it has to use the same kind of storage containers every time. Whether you prefer baskets, drawers, shelves, or closets, the best organization system is the one that works for you. 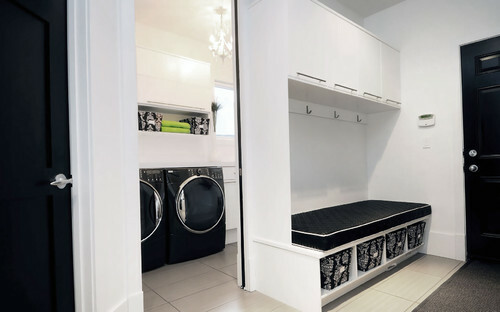 There’s that lucky percentage of the world that has their dream-sized laundry room, but most of us are making do with the more compact kind. And good storage is the decorating trick that can save a room from complete disaster. Did You Say It Doubles as a Mudroom? The good news is you can still make a small space work as both a laundry room and a mudroom. By using a light color palette, you can make a room feel larger. Laundry room rugs in a darker shade keep the room feeling large, since the contrast between the light walls and the dark floor adds depth to the room. Rugs also do a great job of protecting floors from wet and muddy feet, from those with two or four legs alike. If you do have a dog, don’t say I didn’t warn you. They may become quickly attached to your new laundry room rug. Small cozy spaces look like a wonderful place to take a nap when you’re a dog. So bringing it back again to your favorite vintage store and organization. Sometimes you do have a laundry room that’s big enough to play around with furniture. Maybe there’s a really great armoire that you’re hoping to use for storage, but you don’t know if it will go with your modern appliances. Blend modern appliances and vintage furnishings with a rug to break up the textures. A laundry room is the perfect place for fun prints. Rugs are by far the most versatile part of laundry room decor. Whether you keep the rug simple and play with color, or go in search of a print you love, it’s a pretty easy change to make. Say you find a reclaimed wood shelving unit that you want to use. Contrast natural textures against a monochromatic palette, and style your laundry room with a rug that continues the color scheme. Your vintage touches will blend right in. 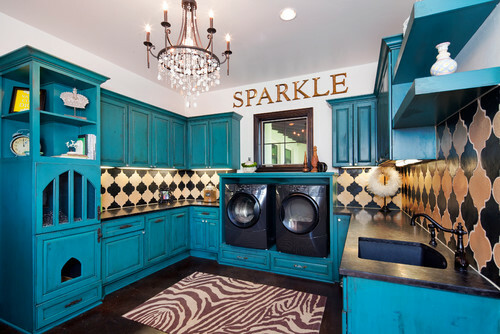 I read somewhere that every laundry room should have a chandelier. That’s quite the assumption, but one I think I could be quite okay with. Wallpaper easily grabs people’s attention. If you find a striking pattern you love, go for it! Then add some cozy sophistication with an area rug, but keep it simple. Pro-tip: thick horizontal stripes make a room look wider. If you had a chandelier in your laundry room, with some personal touches on the walls, and a cozy laundry room rug underfoot, your laundry room just might become your favorite room of the house. By no means do you have to take your morning coffee in the laundry room, but what if you could actually enjoy the time you spend doing laundry?